Can't find what you are looking for online? 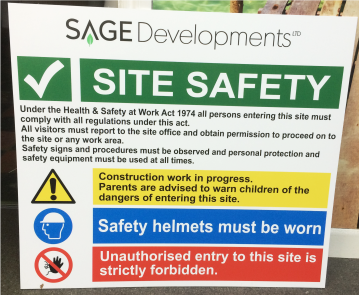 At Bath Signs Digital we can also create bespoke Health & Safety Signs, which are customised to your specific requirements. Simply let us know which size, material, colour, symbol, logo and text you would like displayed on your sign/ signs and leave the rest to us! Displaying bespoke Safety Signs featuring your company name/ logo, is a great way to promote your company, whilst still communicating your safety requirements and warning of specific hazards on your premises. All bespoke Safety Signs are designed and manufactured in house. online, Give us a call on 01225 422688, or you can email your requirements to sales@bathsignsdigital.co.uk.